Westword is a free weekly alternative newspaper out of Denver. While it focuses primarily on arts and entertainment, it's known for quality investigative reports as well. Now they've taken on the issue of Denver's pit bull ban. It's hard not to cheer a little bit while reading the report. It offers as much balance as one can to an issue in which 4,000 dogs have been killed for looking a certain way, not for acting a certain way. Here's the main report. And a rather heartbreaking look into pit bull row, where all confiscated "dogs who look like pit bulls" end up. 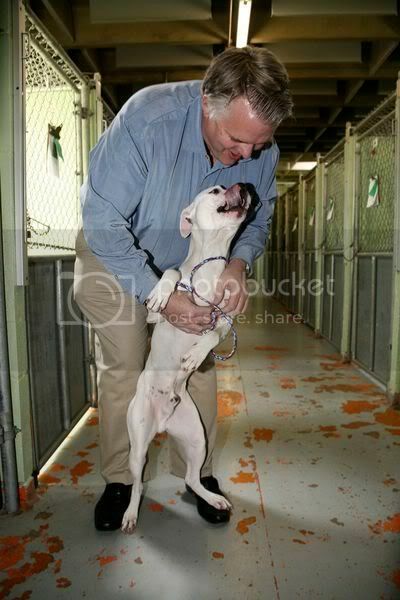 There's one picture (left) with animal control director Doug Kelly hugging an adorable white pit bull mix. It boggles my mind to see a dog with such exuberance for people being pet by a man who will kill him for being a dog with enough physical characteristics that 2/3 "expert" assessors identify him as "pit bull". Denver has never done an audit of the pit bull ban, never conducted a study of how effective it has been, never established a commission to determine whether one of Denver's most controversial policies is actually accomplishing what it was created to do. But evidence from other sources suggests that after two decades of classifying pit bulls as public enemy number one, it could be time for Denver to redo its math. This is something that should bother you immensely. It is ridiculous to draft and implement a law that will be expensive, cost money for tax-payers and that, most importantly, results in the death of dogs based on looks without including a method of studying efficacy. A law is no good if it does not solve the fundamental problem for which it was created. In Denver's case, there is no evidence that it has improved public safety. In fact, Denver has the highest rate of hospitalizations due to dog bites in the state. This indicates a flaw in the two arguments for Denver's pit bull ban - it would reduce pit bull dog bites and, because pit bulls supposedly bite with more severity, it would reduce serious dog bites. The evaluation checklist involves only physical characteristics, not behavior, and the evaluation does not consider anything related to an animal's temperament. The dog might be jumpy and aggressive, or it might be mellow and sweet. It might have bitten people before, or it might be a well-trained family pet that has never released an angry bark. Denver spends money to hire three assessors to go over a visual checklist with each dog who is suspected to be "majority" pit bull. This test sometimes takes three days. And not at any point is behavior taken into consideration. Which again points to a fundamental flaw with a law that looks at phenotype rather than something pertinent to the discussion of aggression, behavior. There are certainly cases in which an overemphasis on one particular physical characteristic may lead to medical problems. But to look at the overall physical makeup of a dog offers no insight into the dog's behavior or how likely the dog is to bite. It does not offer clues as to whether the dog is easily aroused and bites hard or takes a beating before he'll snarl. And since any dog can exhibit agonism directed at humans, it seems foolish to ignore obvious behavioral signals and go straight for the red herring of phenotype. Breed bans start out with a fundamentally flawed premise and go downhill from there. Please be outraged if you are a sane individual. It does not matter if your dog was confiscated from your own home or backyard or if your dog was taken from you while you walked him on leash or if your dog was running loose. 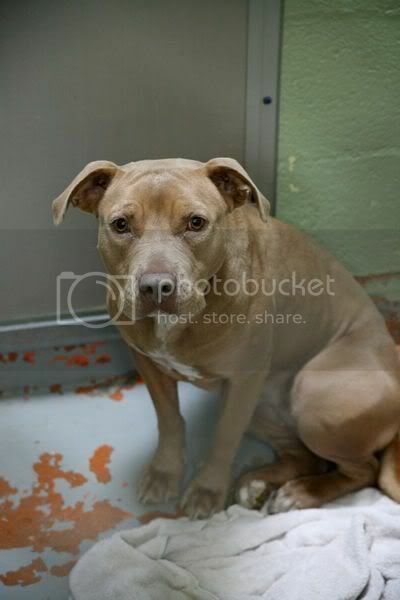 If your dog is deemed "not" a pit bull - that is, you have not violated the law - you still have to pay for the dog's stay at the shelter. That is ludicrous - it foists financial culpability on to the law-abiding citizen. Now obviously if the dog was running loose, then it is your responsibility to own up and pay for the costs associated with caring for your wayward dog (assuming it is illegal to allow your dog to run loose in Denver, of course). But in Denver's case, most dogs are not running loose - they are picked up after a neighbor complains and the dog is removed from the homeowner's property. And then there is the unfortunate reality if your dog is arbitrarily defined as a pit bull. It does not matter if your dog is or is not an American Pit Bull Terrier - it only matters that two out of three people with unknown qualifications have marked enough check boxes on a piece of paper to warrant the higher fee and a get out of dodge requirement. Please do read the whole article. You can leave a comment, thanking them for publicizing this issue and doing a pretty darn thorough job to boot. If you live in or near Denver or just want to drop a letter to the editor, please do so here. Remember, the shorter and more succinct the better. Be polite, respectful. Check for clarity, grammar and spelling. Photo credit: Anthony Camera (seriously? Because that is awesome).